Sports related injuries account for more than five million lost teeth per year-both in adults and children. This is why you are encouraged, especially if you play sports, to protect your teeth with a mouth guard. While protecting your teeth from direct physical impact, sports guards will also absorb the impact on your jaw that could result from various incidences. either in the gym or on the sports field. Sports guards are not a new invention, however; over the years, dentists have started using properly designed sports guards to help athletes not only protect their teeth, but improve their performance. Doubtful of the claims? So were we, until this study: In clinical trials at Rutgers University, it was proven that using the Agility Guard can provide significant improvement in strength by as much as 15-30%. Also there was an improvement in flexibility, balance, endurance, recovery, core strength and stability among other attributes. The procedure to get fitted for an Agility Guard appliance should take you an hour. With use of a computerized jaw tracking equipment to determine the optimal jaw relationship, Agility guard will release your muscular tension. Studies have shown a direct correlation between correct posture of the jaw and overall muscular strength. Whether you need a sports guard to improve your performance or protect your teeth you are advised to have a custom made device. 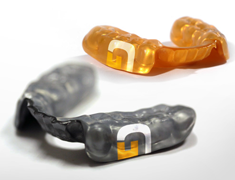 Since the Agility Guard is made to uniquely fit your teeth and optimize your jaw posture, there will be less discomfort, or pain that is usually associated with sports guards. Agility Guard, not only promises to enhance your performance, but also improve your level of agility. The Agility guard will help your jaw stay in a physiologic rest position; muscular tension is released immediately and you can employ deeper muscles for explosive strength, muscle alignment, improved agility, balance and endurance. This can be demonstrated quickly with an agility test that can be performed at NYC Smile Design.